Savory plays an important part in Armenian, Georgian, Bulgarian and Italian cuisine, particularly when cooking beans. It is also used to season the traditional Acadian stew known as fricot. Savory is also a key ingredient in sarmale, a stuffed cabbage dish in traditional Romanian cuisine. The modern spice mixture Herbes de Provence has savory as one of the principal ingredients. A recent study found the essential oils of Satureja edmondii have antimicrobial properties and can protect food from S. aureus. The test was conducted on commercial soup products. 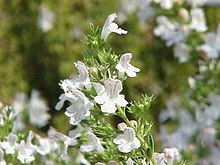 The heterogeneous mixture of the Satureja hortensis L. essential oil in water serves as a natural herbicide. The addition of this mixture inhibits the root elongation of weeds which reduces the weed’s root-to-shoot ratio. This further reduces the weed’s cell division and inhibits its germination, growth, and physiological processes. Essential oils of Satureja khuzistanica have been shown to have anti-inflammatory properties which can be useful in medical treatments. A recent study found that higher concentrations of essential oils of Satureja khuzistanica helped reduce adverse effects of traumatic brain injuries in rats. The etymology of the Latin word “satureia” is unclear. Speculation that it is related to saturare, to satyr, or to za’atar is not well supported. The ancient Hebrew name is ṣathrá צתרה. ^ a b Moradi, Shirin; Sadeghi, Ehsan (2017). “ERROR: The requested URL could not be retrieved”. Journal of Food Processing and Preservation. 41 (4): e13337. doi:10.1111/jfpp.13337. ^ Hazrati, Hossein; Saharkhiz, Mohammad Jamal; Niakousari, Mehrdad; Moein, Mahmoodreza (August 2017). “Natural herbicide activity of Satureja hortensis L. essential oil nanoemulsion on the seed germination and morphophysiological features of two important weed species”. Ecotoxicology and Environmental Safety. 142: 423–430. doi:10.1016/j.ecoenv.2017.04.041. ISSN 1090-2414. PMID 28456128. ^ a b Abbasloo, Elham; Denhgan, Mohammad; Najafipour, Hamid; Vahidi, Reza; Dabiri, Shahriar; Sepehri, Gholamreza; Asadikaram, Gholamreza (September 21, 2016). “The anti-inflammatory properties of Satureja khuzistanica Jamzad essential oil attenuate the effects of traumatic brain injuries in rats” (PDF). Scientific Reports. 6 (31866): 31866. doi:10.1038/srep31866. PMC 4989136. PMID 27535591. ^ a b F. E. J. Valpy, An Etymological Dictionary of the Latin Language, 1828, p. 542.